The Hawker Hurricane has been the most widely used fighter by the British Royal Air Force at the beginning of World War II. The Hurricane was powered by a Rolls-Royce Merlin 12-cylinders, liquid-cooled, with more than 1,000 HP that could lead to a speed above 500 km/h. The eight 7.7 mm Browning machine guns, which equipped it , guaranteed a good firepower. Although it was slower and more antiquated, for aerodynamic design, then the famous "colleague" with whom it shared the operational engagement during the Battle of Britain, however, was more robust, cheaper and easier to maintain and repair. 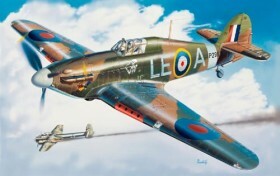 He has contributed significantly to the victory of the RAF during the Battle of Britain, but during the war, it has gradually given the role of front-line fighter to the more modern Spitfire.